Using Xerox Genuine toner and ink in your Xerox printer will ensure that prints are delivered with consistent quality. 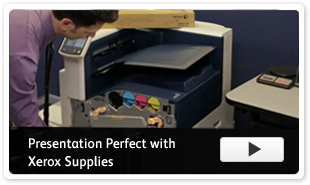 Testing conducted by independent printer evaluation laboratories proved Xerox Genuine Toner Supplies are more reliable and deliver up to 27% higher page yields than aftermarket alternatives. For worry-free printing each and every time, count on the guaranteed quality, reliability, and performance of genuine Xerox toner supplies for your Xerox printer. Independent analysis shows that Xerox toner cartridges produce superior results, providing the best overall value and lowest total cost of ownership. Reorder toner and ink included in your service contract.